Each year the Trumpet Awards recognizes the accomplishments of African Americans who have succeeded despite great odds and have inspired success in others. 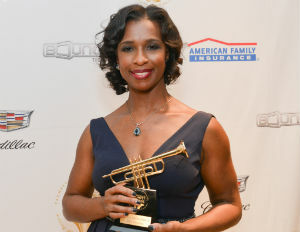 This year, for the 24th Annual Trumpet Awards, General Motors officially announces that senior vice president of Global Connect Customer Experience, Alicia Boler-Davis, has been named the 2016 Corporate Executive of the Year, recognized for her accomplishments and impact on the industry, thus far, with GM. Boler-Davis began her career with GM in 1994 as a manufacturing engineer. Throughout her GM career she’s held several positions in manufacturing, engineering, and product development eventually becoming GM’s first African American female plant manager. She became senior vice president in 2014. In addition to her current position, Boler-Davis is also a member of the Northwestern University McCormick Advisory Council, a board trustee of the Care House of Oakland County, a member of the OnStar/Shanghai Board of Directors, and Executive Liaison for the GM WOMEN leadership board. She received a bachelor’s degree in chemical engineering from Northwestern University and masters in engineering science from Rensselaer Polytechnic Institute. Watch Boler-Davis receive her Corporate Executive of the Year honor on the 24th Annual Trumpet Awards tonight, Friday, Jan. 29th, at 9 p.m. on Bounce TV. Prepare to hear from Boler-Davis live at the 2016 Black Enterprise Women of Power Summit, March 6-12 at the Hilton Diplomat Resort & Spa, Hollywood, Florida, where she will celebrate top women in advertising and marketing who have overcome barriers and challenges. Register now using code MLK16 for a special discounted rate. For information on the 2016 Women of Power Summit including sessions, speakers and performers, click here. Be sure to check back as updates are announced.